Like choosing the perfect accessories to complement a little black dress, choosing the finishing touches for a room can make or break the look. After months of backbreaking work, tedious labor, and even an injury or two, the paint was dry in our master bedroom and we were finally ready to take on the accessories. But where and how do you start? 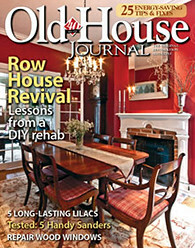 Personalizing a space, especially a bedroom where you spend approximately one third of your life, is the phase of decorating when you can truly make the space your own -- bringing in photos, accessories, materials, and sentimental items that make brings you a sense of personal comfort, rather than a bland look purchased straight from the pages of a catalog. In addition to trying to bring comfort to your space, personal taste is a significant element that comes into play when accessorizing. While I enjoy and appreciate a layered and collected look, I'm not a big fan of feeling like every inch of a wall needs to be covered. Although there seems to be a trend to frame every garage sale find and nail it up to a wall with 100 other collectibles, in this space especially, I felt less is more. I wanted the room to visually breathe, and I needed calm places for the eye to rest. One thing, in particular, that I really struggled with was the decision of whether or not to hang items on the wall over our bed. Our bed, an 1890s French antique purchased from eBay, is very ornate. Here's a look at it before we started the makeover of the room. Its scalloped, arched top makes accessorizing difficult, as I felt that anything hanging on the wall behind it would compete with the bed. Although leaving the wall blank leans toward the simpler side, in the end I opted not to hang anything in order to leave the bed as the focal point. 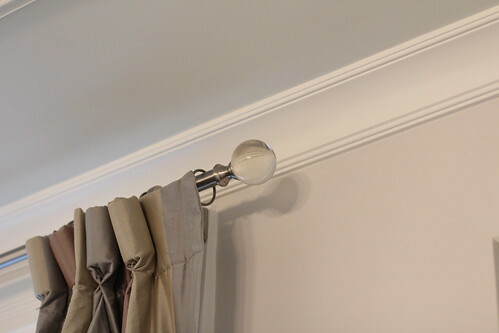 Lighting in our room is another critical design element. 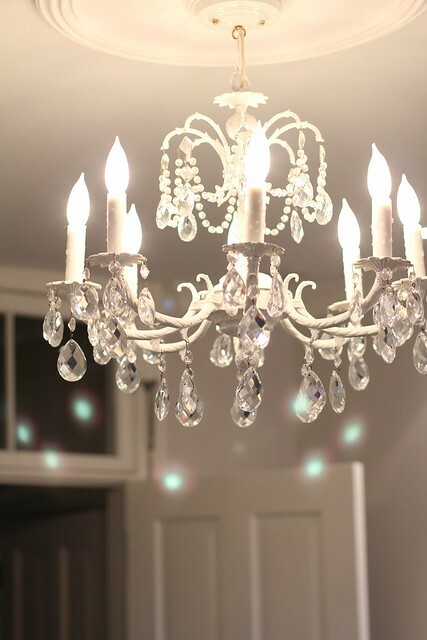 We've discussed the importance of accent lighting and how it impacts a room's decor, but a lighting fixture can also act as a significant focal element in the room while also providing excellent light. Perched above the foot of the bed, replacing the hulking dark ceiling fan that once resided there (and haunted Alex at night), is a vintage eight arm chandelier. This delicate, feminine fixture was a gift from my mother in law on my 25th birthday. It sat idle in our basement for years, just waiting for its moment in the sun. After giving it a fresh coat of antique white spray paint and an extensive cleaning of the large number of crystals, it was ready to be the crowning jewel in our new space. I particularly love the way light reflects through the crystals and dances on the walls during the late afternoon on a sunny day. When you enter the room, the striped silk curtains draw your eye upwards, but I also wanted to include a special touch at the crown of the window wall. These substantial curtain rods from Z Gallerie were just what I was looking for, blending silver hardware with a more modern glass finial. Not wanting to leave the curtain rods feeling like the odd modern man out in a traditional room, I set out in search of lucite bedside lamps. I was thrilled when I found these petite beauties at our local TJ Maxx. I tend not to follow trends when decorating, but if I want to mix in something a bit more "current," I often to do so in my selection of minor accents. Why? 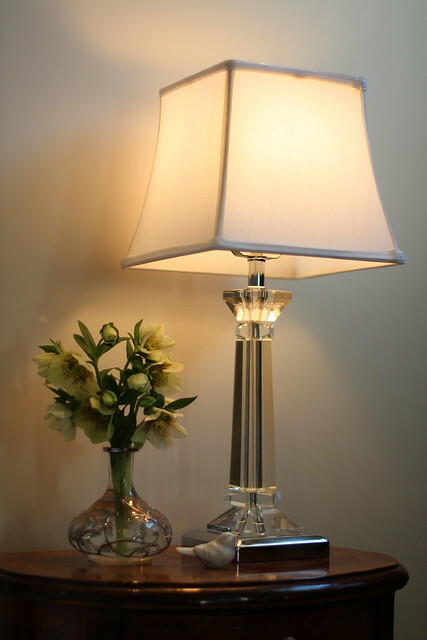 Because accessories tend to be the most affordable and easiest items in a room to replace or repurpose. So even if I tire of these lamps in a few years, picking them up at a discount store means I won't sweat it as much as I would if I were to tire of something larger, like a piece of furniture or a rug. Accompanying the lamp on my side of the bed is a treasured bud vase, given to me by my grandmother, along with a cute little ceramic bird, picked up in a shop during our first trip to New Orleans. 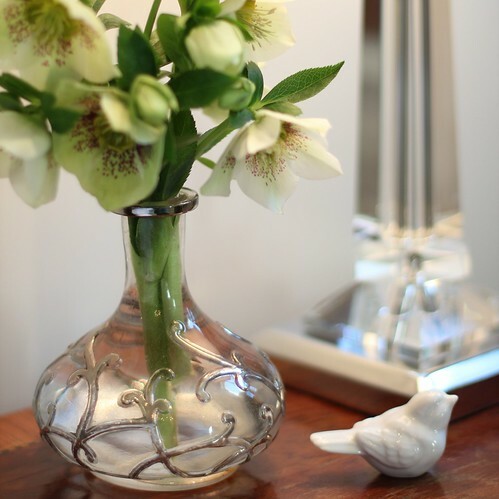 Choosing accessories with a story or memory tied to it makes the room feel much more personal. Rather than chucking every surface full of random knickknacks that have no real meaning, I love looking around the room and seeing items that remind me of enjoyable times or special people. Nestled between the curtains sits our dresser, handed down to me by my parents. This dresser, picked up second hand in the 1970s, was part of their first bedroom set after they were newly married. Now, updated with brushed silver hardware, its curvaceous lines blend seamlessly with the style of our bed. 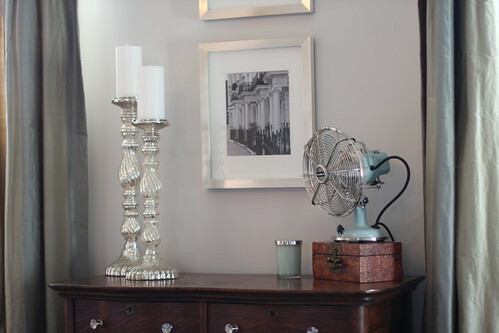 Atop the dresser sits two mercury glass pilar holders from HomeGoods, an antique Asian box given to us by a close friend, and a functional retro fan in a fun color, picked up from Restoration Hardware. The fan is one of those items that looks great while serving the critical fall and spring time function of air circulation. Proudly hung on the wall above the dresser is another very personal set of items, two framed photos taken on one of our best vacations of all time, our trip to London in 2006. The upper photo is of the exterior of the inner castle within the walls of the Tower of London, while the lower photo is of a stunning row of house entries in Notting Hill. 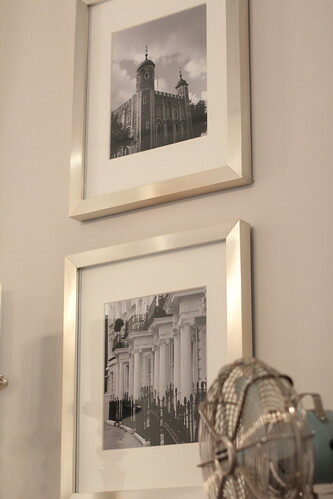 The photos are our originals turned black and white to complement the palette of the room. Let's turn our attention to the other side of the room, starting with Alex's bedside table. 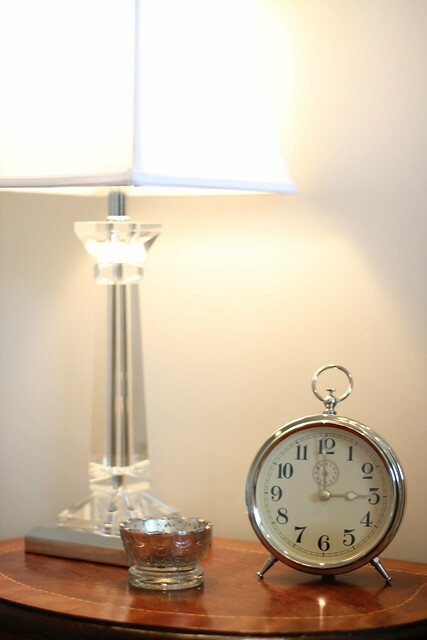 Accompanying the matching lucite lamp is a vintage inspired alarm clock from Pottery Barn, and a small mercury glass votive holder purchased on our 2012 trip to Napa Valley. I kept the accessories on the smaller side, as Alex's phone charges here each night. 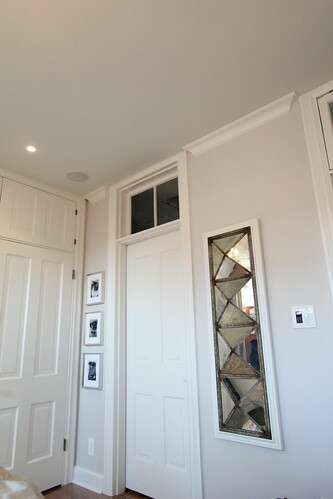 On the wall across from the windows you'll find the doorways leading to the master bathroom as well as the hallway. 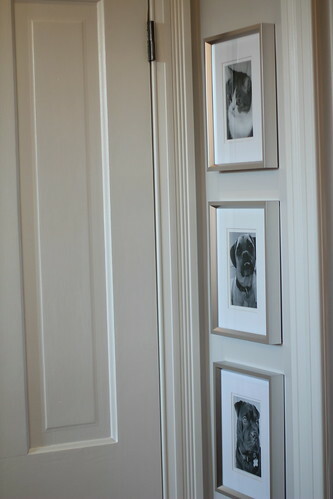 We kept it relatively simple on this side as well, adding visual interest by hanging a unique three dimensional mirror as well as framed family photos. 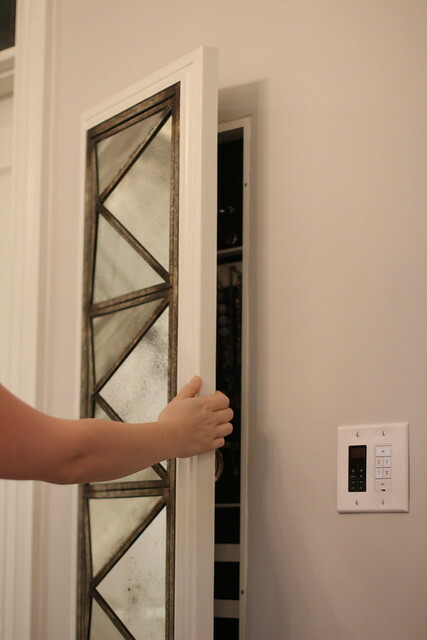 As we recently revealed, the mirror neatly conceals a built in jewelry organizer. And the family photos? They're black and white enlargements of our some of our favorite shots of our four legged babies, framed in pre-matted brushed silver frames from Pottery Barn. I love looking at these photos each night as I fall asleep, and every morning when I wake up. As you can see I've put a lot of time and effort into determining and layering in the best and most appropriate accessories for our bedroom. 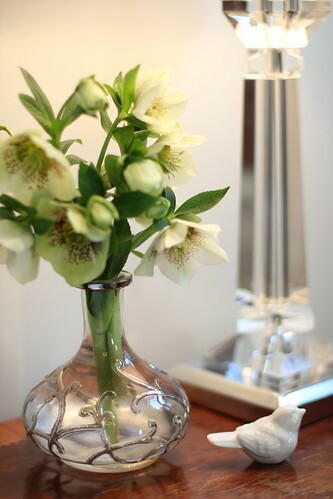 Rather than throwing a whole bunch of items in the room to "fill it up," I took my time in finding the pieces that would both "work" as well as would add a personal touch or trigger a thought of those closest to me. 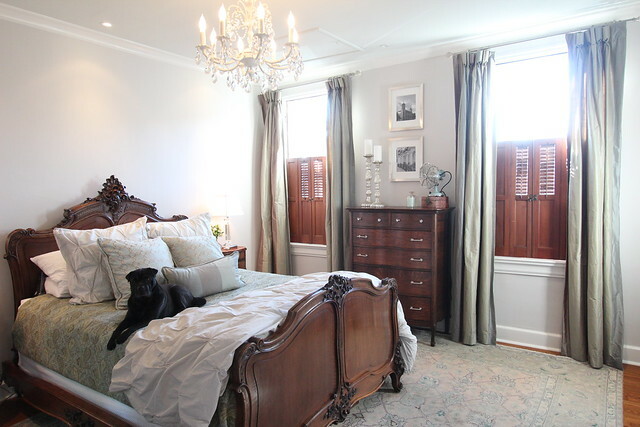 To keep it more interesting, occasionally I pull in accessories from other rooms of the house, bring in flower or plant clippings for a fresh addition, and rotate our bedding for the season. Though it took much longer to truly complete the arrangement, it made the finished product so much more special and enjoyable. 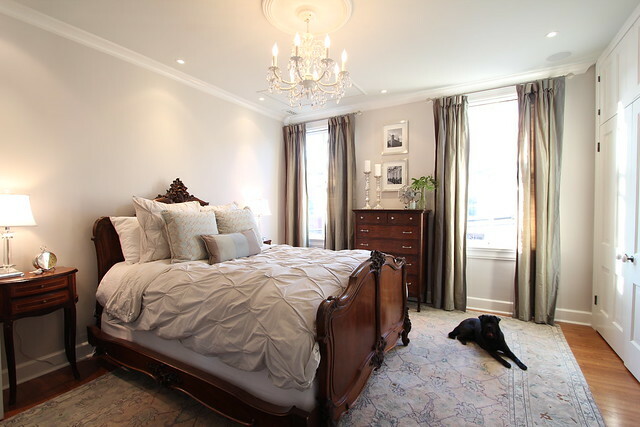 Now our master bedroom, the room that was once a cold and uninviting space where we begrudgingly slept at night, is our calming and sentimental sanctuary where we are both happy to rest our weary bones each night. What sort of decor philosophy do you have in your home? Do you like to take your time and layer in special items, or are you an "eyes on the prize" type of person who is more anxious to get to the finish line on a project? Do you have anything that is particularly special in your bedroom's decor that you particularly enjoy, or is your bedroom simply a place where sleep happens? I'd love to hear your comments. 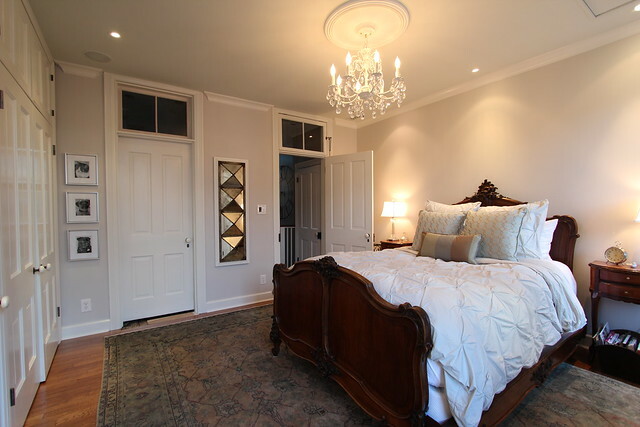 Congratulations on another very beautiful room in your gorgeous home. I'm a transplanted northeasterner living in Colorado and I absolutely love the slice of the east that I get from reading your blog. Congratulations for avoiding the trap of embracing every new fad, too.It is refreshing! I love your bedroom. It makes me think of a bed and breakfast! I like how the little decor you have is timeless and classic looking. I've seen some other bedrooms where the owners seem to embrace all the new fads or put so much stuff on the walls that I don't see how it is relaxing. I haven't done much with our bedroom yet but when I get to it--this is the feel I hope to achieve! Thanks, Merilee! I wanted to keep this space as relaxing and uncluttered as possible! I adore your bedroom - especially the bed and the rug. I need to start shopping on ebay more. I've only won small auctions - buying a rug or piece of furniture really scares me. Do you stick to local pick ups or sellers who ship directly? A lot of items I've been interested do not ship unless the buyer arranges it through a freight company, or shipping isn't calculated until after you've won. Any tips? Hi Lindsey. We've done local pickups, seller ship, and freight ship. In the case of large items, we always contact the seller before bidding to get a shipping estimate, and then we factor that into how much we're willing to bid. 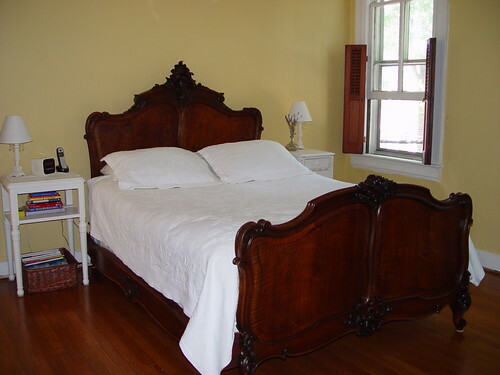 Our bed and grandfather clock both came via freight, and we were really happy with the service. I'd recommend going for it! In our craftsman, I tended to go with dark & masculine rooms, but here in our new condo I'm thinking of going light and airy in our bedroom. I really, really, really love what you've done with your room. Where did you purchase that rug? We have almost the exact same colors in our master and would love to compliment it with a nice rug like yours. Your bedroom is perfect. Very, very well done. A few other notes: I love your Pottery Barn frames - I always forget they have frames, and those are exactly the style I'm looking for. I love your bedroom and your accessories! You're right about putting a bunch of things together. I think I have too many accessories around the house. Thinking about getting rid of some. Homegoods can be dangerous. Where did you purchase your duvet? It adds just enough interest without being too fancy or ornate. Love, love your bedroom. Where did you purchase the striped drapes? I had read your bedroom post before but revisited it again today. Lovely!